How can I get away from Cubicles? Do you want a office that offer more flexibility while enhancing your creativity? It’s time to get away from the office cubicle and go for an open space office. In the office space, the cubicle is something workers dread. It’s like a prison with gray felt walls. There’s nothing unique about it. with an open space office layout, you can have more flexibility creating your ideal office space. The open office space will eliminate wasting space. When we waste space, we find ourselves more frustrated and prevent ourselves from showcasing our natural born talents. The open office will allow better communication, while leveling the workforce hierarchy at your company. It does take some initial adapting to get use to the open office space. Open office space will give you more opportunity to add visual stimulation, increase freedom in work style, and expand office design. Mark Downs Office Furniture can help you pick the right office layout for your office environment and also help you select the right ergonomic furniture for the office. A good office design is about creating a resilient work environment that allows the office to adapt to your needs. There needs to be a balance between privacy and effective work collaboration layouts. By having a good balance of privacy and collaborative workspace, you can reduce the likelihood of office chaos occurring. You will want an office space that puts you at ease while keeping your office innovative. Let’s get those creative juices going today. 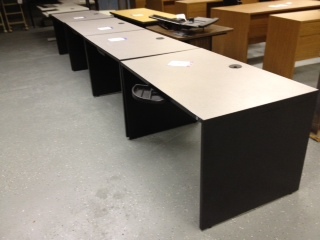 Have a look at our website to see our new and used furniture items. You won’t be disappointed. This entry was posted on Friday, April 25th, 2014 at 2:09 am. Both comments and pings are currently closed.